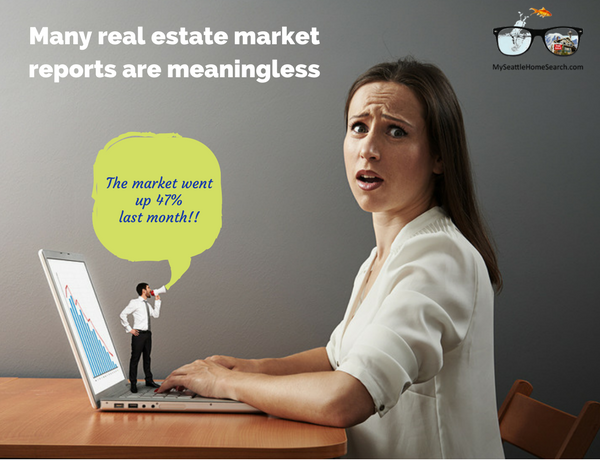 Statistically speaking, many Realtor real estate market reports are unreliable and misleading. Why many real estate market reports are meaningless. Statistically speaking, many Realtor market updates should be recycled immediately! Facts are stubborn, but statistics are more pliable - Mark Twain. Probably the most common question Realtors get is "how's the market doing?" Home buyers and home owners are always interested in knowing what direction the market is headed in their particular neighborhood. A Realtor's personal experience in the trenches and good old gut feeling are good, but solid real estate statistics are better at conveying what the real estate market is really doing. Real estate agents have access to lots of real estate statistics either through their Multiple Listing Service (MLS) or through real estate statistics software like TrendGraphix. However, it's how they select and use that data that matters. Some Realtors produce excellent market upates. However, just as some real estate advertising can be misleading, some real estate statistics are best avoided. Real estate market reports are everywhere and are probably the most common type of blog post that real estate agents write. The great thing is that you can use the same template as the previous month and just copy and paste the whole thing, remove September's numbers and replace them with Octobers stat's. Then hit the publish button and you're done. Statistically speaking however, many of those monthly reports that Realtors stick in the mail or mail out to their clients are at best "for amusement purposes only". Some data is about as reliable as the results of a North Korean poll for "are you happy with your current leader? "So how do you tell the solid stats from the gibberish? Here's an example based the Seattle real ESTATE market. To illustrate the difference between what can be considered reliable data and real estate market data that you shouldn't hang your hat on. I'll use data from Seattle home sales to demonstrate the effect the total number of sales in an area has on the reliability of the data generated. I live in the Loyal Heights area which lies at the north end of the fabulous Ballard neighborhood. And Ballard is a Seattle neighborhood northwest of downtown. Here we'll look at the 2 year trends for the median sale price of single family homes in Loyal Heights, Ballard and Seattle for August 2015 through September 2017 . The number of monthly closed sales is shown in the rows highlighted in yellow. Note that all data comes from the North West Multiple Listing Service (NWMLS) and charts are composed using TrendGraphix software. 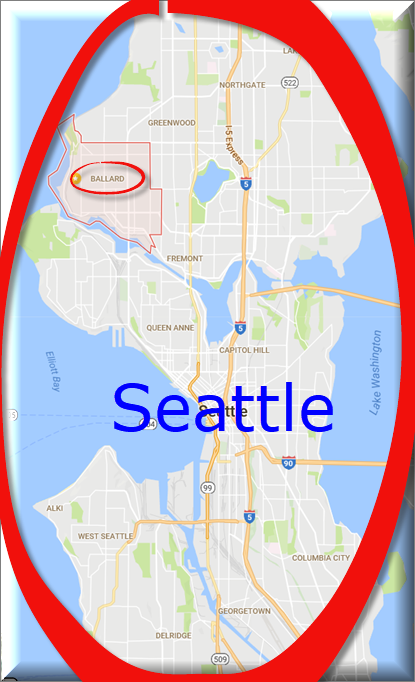 There is an obvious difference in the data as you go from the smaller area of Loyal Heights, through the larger Ballard neighborhood and then the city as a whole. The trend goes from randomness to a smoother, more obvious trend. For Loyal Heights, there are big fluctuations from month to month, whereas for the Seattle real estate market trend there is only slight changes between consecutive months. So which set of data do you think is a better representation of what the market is doing? Sorry, no prizes. Then main reason is simply the difference in the number of closed sales for each area. For Loyal Heights, the most homes that sold in any one month was only 13 and most months had single digit sales, One month had no sales. When you look at the Ballard neighborhood, the lowest number of sales was 20 and the highest was 83. 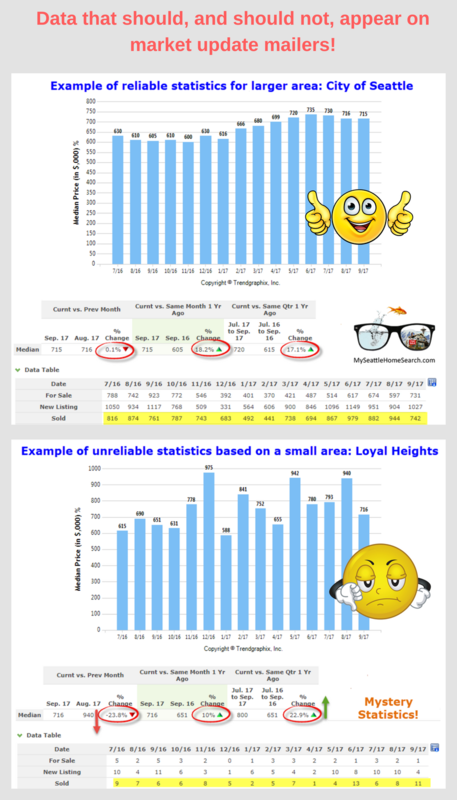 Definitely better than Loyal Heights as demonstrated by the improved trend plot. For Seattle homes as a whole, the lowest number of sales in any one month was 357 so can expect a lot less variation in the data. For the small Loyal Heights area, you can still pull some useful data such as the number of sales each month and information on how long homes take to sell (data not shown). Just don't plot the data in a trend graph and do month-over-month and year-over-year price comparisons. Below is an example of the type of data I will see on Seattle real estate agent mailers sent to my home from agents targeting my neighborhood. They want to focus on hyper-local data but the more local they go the more unreliable the data becomes. In the mock up example below, the data covers the 12 months sale price trend for Loyal Heights versus that for all Seattle single family homes. Unfortunately the mailers will only have the hyper-local chaos plots and not the whole city data or at least a larger area like Ballard. For Loyal Heights, how can prices be down 23.8% this month versus last month, while at the same time prices are up 22.9% this quarter versus the same quarter last year? Pretty, pretty, pretty impressive! I know, curb your enthusiasm. Yes, I sigh a little when I get these in the mail. Always recycle! By the way, those Seattle real estate statistics are correct. Prices really have gone up 17+% (on average) over the past year. Some Seattle neighborhoods, even more than that. Home prices have been increasing at twice the national rate for the past year and are about 55% above the previous highs seen in 2007. REal estate statistics advice for realtors, buyers and sellers. All real estate is local but the more local you go, the fewer the sales and the more unreliable the data becomes. Conversely, the larger the area you include the more reliable the statistics, but potentially, the less relevant they might become for a particular neighborhood or development. The real estate market doesn't dramatically change over-night, week over week or even month over month. You'll hear the news guy on the radio say: "Numbers from the National Association of Realtors show that sales dropped in August by 2% compared to July". And then a month later the same guy is saying "Home sales are up 2.5% over last month". Ignore short term real estate data and just focus on longer term, multi-month trends. Just like your 401K! For markets with a smaller number of sales, use longer time periods to allow for market fluctuations. Instead of looking at month to month data, group data together for say 6 consecutive months and average it out like I did for this recent Ballard Seattle real estate market report where I specifically looked at Ballard houses only and broke down the market based on the number of bedrooms. Feel free to take a look and cut me down a few pegs. You can't predict the future based on current market statistics, but you will be able to look back with foresight and declare..."Ah that's where the market started to change!" A real estate market report cannot tell you the current market value of your home. It can give you a wild and woolly approximation of how much it might be worth +/- 20%. For a reliable evaluation of your home's market value you will need an agent or an appraiser to do a comparative market analysis. The condo market and the single family home market are separate markets and can behave differently even within the same neighborhood. Do not extrapolate data from one for the other. Just because the single family home market went up by 25% over the past 4 years, it does not automatically follow that YOUR home also went up by 25%. It might have actually gone by more, or potently a lot less. A home is worth what a buyer is willing to pay for it. Ignore market report that quote prices per square foot numbers. You might as well be looking at those inaccurate Zillow Zesstimates! If there are usually only a few sales for a particulate area or neighborhood, then the market report should not present the data in a trend plot and should just list them in a table. Also, avoid the temptation to include year-over-year price comparisons. Even within the same neighborhood, different price points will probably behave differently. For example, in a hot sellers market, more affordable homes will attract a larger buyer pool including first time buyers, have increased competition, sell quickly and probably for well above list price. Higher end, million dollar homes, even in a hot market can take longer to sell and not be bid as high. The buyer pool is a lot smaller for these homes. Therefore, an overall average for the whole neighborhood might not reflect the true market for each price tier. Might be better to do a separate report for each, assuming there are enough sales of each of course. The above article "Why Many Real Estate Market Report Are Meaningless"" was written by Conor MacEvilly. Conor is a Realtor living in the Ballard neighborhood of Seattle. He works with both home buyers and sellers in the greater Seattle real estate market and on and on the Eastside in neighborhoods like Redmond, Bellevue and Kirkland. Conor can be contacted directly via his cell at 206-349-8477 or via email at conormacevilly@gmail.com. To learn more about what makes Conor tick, click here. Good article. A statistics 101 level of knowledge helps with reading statistical reporting for all news reports. I saw a typo and thought I'd share it. I believe you meant to use the word "particular" rather than "particulate" in the sentence that begins, "If there are usually only a few sales for a particulate area or neighborhood,"
Thanks for the kudos and type heads up Luke. Unfortunately, I can't find that typo despite going through the post twice.